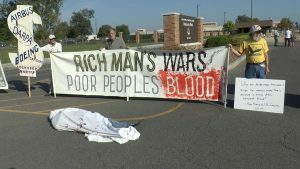 At 9 a.m. on Monday, September 25, seven members of the grassroots group Upstate Drone Action once again were arrested as they delivered a citizen’s war crime indictment to the chain of command at Hancock Air Force Base in New York. Upstate Drone Action also placed a huge dollar sign [$] dripping with “blood” in the main entrance way to the base. The six-foot-high dollar sign dramatizes what the group believes determines the many overseas wars the Pentagon/CIA engages in: corporate greed. Early on the morning of September 20, at least 150 French police were involved in raids on the House of Resistance in the small village of Bure and other activists’ residences. Dozens of police broke through the door at the house of Resistance to enter, and also forced their way into camp trailers and vehicles parked on the property to gain entrance. Residents were held for up to ten hours in the rooms or camp trailer where they were found, many asleep at the time. 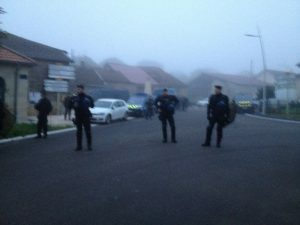 At the same hour, fifteen police raided and searched an old railway station in Lumeville occupied by dump opponents, while three homes of activists in nearby Commercy and Mandres were also searched. Police acted on a warrant related to vandalism last June at an affiliated hotel/restaurant at the research center outside Bure. The identities of all who police encountered were recorded, while the entire contents of the office in Bure were seized as evidence, including a copy machine, computers, hard drives, phones, papers, books and other property. Similar property seizures took place during the other four raids. Two people in Bure were taken into custody and to separate local police stations, then released later in the day. 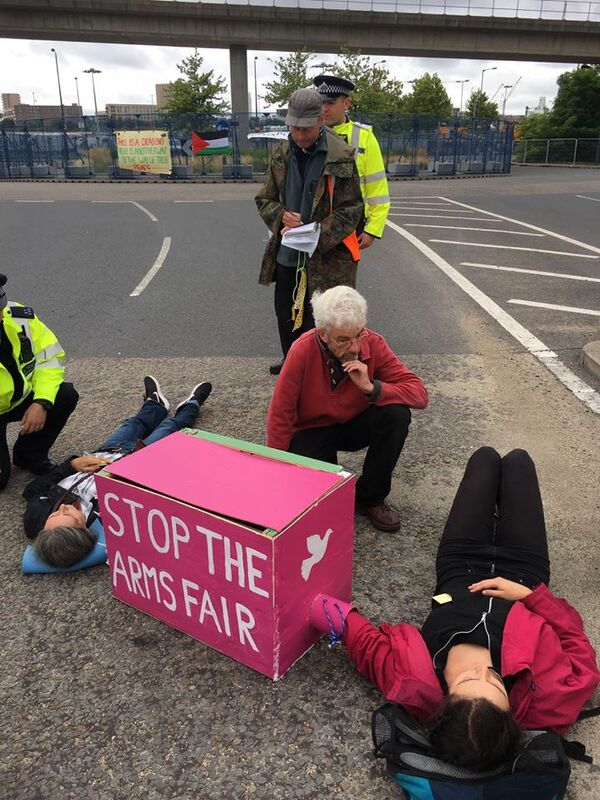 Over one hundred people were arrested during a week of nonviolent direct actions challenging the world’s largest arms trade fair, the Defence and Security Equipment International (DSEI) exhibition held every two years in London. Leading up to the arms bazaar opening on September 12, thousands of people joined in strategically coordinated actions that successfully disrupted the shipment of massive hardware and glitzy displays into the exhibition halls and pushed the set-up schedule back for days. Beginning September 4, each day of protest had a different theme, and campaigning groups across the broad Shut Down the Arms Fair coalition created actions to spotlight the connection between their work and the global arms trade. Daily blockades and multiple lock-downs at two gates created a logistical nightmare for delivery trucks while keeping teams of police occupied with cutting through metal and concrete locking devices or coaxing down banner-hangers dangling from an overpass. London police announced at least 102 arrests between September 4 and 11, and organizers report that protest continued through the duration of the exhibition and several more arrests were made. Most are charged with obstruction and summoned to court for first appearances in late September and early October.